I hope you are all doing well post-Hurricane Irma. We are delighted to announce that there was no damage to any of the homes in our community! We do have some clean-up of tree branches and leaf debris, but when all is said, we weathered Irma extremely well. 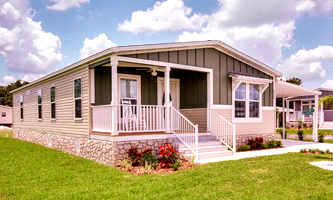 This is another testament to just how well manufactured homes are built. These gentlemen express what it is to be part of the Florida Lifestyle. Yes, we have hurricanes, but natural disasters occur everywhere. At River Villas we don’t contend with coastal storm surge, we are twenty-nine feet about sea level and about thirty-four miles from the Atlantic coastline. There are benefits to living inland and lower homeowner’s insurance is one of the more obvious. According to PalmBeachPost.com, HomeInsurance.com has ranked Florida’s cities based on their evaluation of NOAA-identified storms from 1965 to October 2014, doling out scores based on the number of storm events, number of storm-related deaths, property damage and storm-related injuries. Our closest city, at a distance of just twelve miles, is Palatka and it ranked #5 on the safest city list out of the whole state! Woohoo! You may be asking yourself why you live in Florida or you may have friends or family who are considering the move, well Florida is still Florida. We have extraordinary weather all year long, beautiful scenery, outdoor recreation opportunities galore, a multitude of cultural events and to make things even sweeter — we have no state income tax, no pension tax and a low cost of living. Yes, Florida is still the place to be. The River Villas Management Team is glad everyone is safe in our community and we look forward to stupendous fall and winter weather.